Last night I had to make the hardest decision I have ever had to make and put my yorkie Diesel down. Diesel was only 9 years old. He was diagnosed with Heart disease a year and half ago. He was such a fighter and was on so much medicine and he did really well for the first year. But in September of last year things started getting worse.. The vet was able to put him on some different medications and he got better for a while. But the last month or so things have been pretty rough. On Monday he started going into congestive heart failure. We took him to the vet. He stayed the night in oxygen and he got a little better so I took him home. He did get a little better but not much. He wasn't himself. He didn't want to eat or go for a walk and he was struggling to breathe. When I got home last night he was doing really bad. I watched him for a couple of hours to see if he could fight through it but he couldn't and things just started getting worse. So we took him to the vet and made the decision. I am heart broken. Diesel was not just a dog to me. He was a family member. He was so special. I had him for 9 years and I am having a hard time imagining my life with out him. Everywhere I went he was right there behind me. My house is so quite without him here. He was suffering and I know he is in a better place and he isn't suffering anymore but all I can think is that I would give anything to have him back. I don't know how I managed to get this blog post done. We took these pictures last weekend so I wanted to post them. I am trying my hardest to continue on with my normal daily routine and keep myself busy but it is so hard. Diesel was everything to me. Our lives revolved around him (especially since he got sick). He brought us so much joy and I am so lucky that I got to have him in my life for as long as I did. He will always have a special place in my heart and I will miss him forever.There will never be another like him. Oh no, I'm soo sorry to hear this. Stay strong! I'm so so sorry & sad to hear this! so sorry for your loss, time will make you fell better! it is so great that you have the best memories, and for that you will be grateful! Praying for you! Our puppies truly are our best friends. They always hold a special place in our hearts no matter how much time has passed. Praying you have a peace filled day. SO sorry to hear this Jade. Our dogs are such a huge part of our lives and my heart breaks for you...prayers!! Jade, I very rarely take the time to leave comments, but I just felt compelled to let you know that my heart truly goes out to you. I completely understand what it is to have a pet feel like a child, and the loss must be devastating. You will be in my thoughts and prayers. My heart goes out to you Jade! Remember all the wonderful times you had with him. I'll be praying for you. This broke my heart. I have a sweet furry family member and can't imagine how you must feel - I was tearing up reading your story. I hope you will find joy in remembering what Diesel brought to your life and find comfort in that. i'm sorry for your loss. you will be in my thoughts. my puppies are my life and i can only imagine. I am so sorry for your loss. My heart breaks for you as I know how you feel....my puppy is my firstborn and she means a world to me....Thinking of you! I have a dog who is like my baby and my parents have 3 dogs that are like my siblings so I know exactly how you feel. I'm so sorry about the loss of your dog, he was a cutie! I'm so sorry for your loss and will be thinking of you. Jade, I am so sorry to hear about Diesel!! We had to put out Yorkie (Tucker) down back in December. It was the hardest thing we had to do. My heart breaks for you because I know how much you must be hurting! Try to remember the good times and think about how he's not in pain anymore! You'll be in my thoughts & prayers!! I am so sorry to hear about your loss! All the love in the world your way! Jade, I am so sorry. I pray you and your husband will find comfort somehow and the pain will eventually as strong as it is right now. I am so sorry and I understand your pain. Last year we put our girl down, she had bone cancer and there was nothing we could do. It hit her hard and fast, she hung in there for a few months but her body just broke down. I still have her picture as my phone's background and smile when I see her. Jade, I am so so sorry for your loss. The pain of loosing a pet really is like loosing a family member. I know this isn't much help but in the past I've clung to the fact that I was so lucky to ever have such a wonderful pet that made letting go so hard. Some people never have that amazing connection and love with an animal. I'm so sorry, Jade. I know how hard it is to lose a pet. 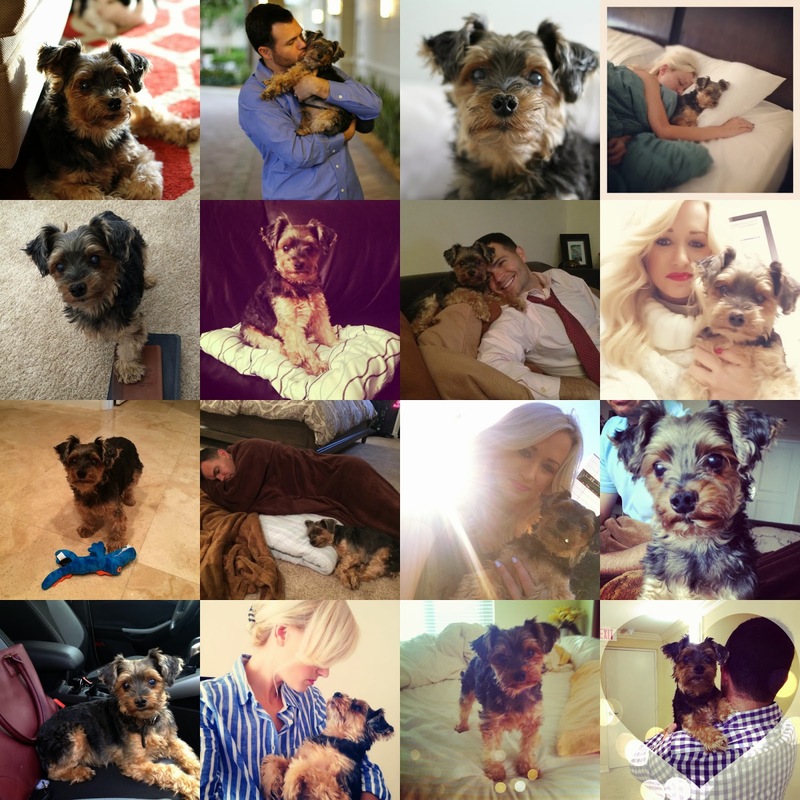 I just lost my Bentley unexpectedly on January 2 [you can read about it here if you want]. He WAS my child. Luckily, I still have his sister, Chloe, here with me but things haven't been the same since and neither have I. It gets easier with time but it's still so heartbreaking. It's been over a month and I still have a hard time to get the motivation to do anything, really. When he left he took a huge part of me with him. I hope you find peace in knowing your sweet boy is in a better place and no longer suffering, and that you gave him so much love. You should look up the poem Rainbow Bridge. It made me feel a little better ;) We will meet our babies again one day! I am so very sorry for you loss. We have two dogs who are truly like children to us, and it will be an extremely devastating day when we lose them. Stay strong, and remember we are all here supporting you and lifting you up during this difficult time. Oh Jade my eyes are so full of tears! I am so so sorry for you- it is the worst to experience what you just did. Thank you for sharing all of your adorable photos of Diesel- what a great little doggy and I am so in love with him from just these photos! I hope you find some comfort this weekend knowing he will be at ease and I wish you alll the best during this extremely difficult time :/ XOXO Huge hugs from Boston! My heart goes out to you. Losing an animal is horrible, nothing can prepare you for the loss and not much can make you feel better. Sending love your way. I am so sorry, my thoughts are with you! Aww I am so sorry for the loss of your dog, I know how hard it is to lose a pet! I love that outfit. Stay strong! So sorry to hear this! Putting down a dog is always so hard, just remember he isn't hurting anymore. I am so sorry to hear this. We went through the exact same thing with our sweet Skyler. It will be three years on April 30 and we still miss him so! He was my fourth child and the best dog we could have asked for. The ten years we had with him were not nearly enough. My daughter eventually wanted another dog, and though he will never take the place of Skyler he now brings us joy and love as well. Again, I know how you feel Skyler also had a heart problem. Take care. So sorry. Went through the same grief myself with our Yorkie. Hope you're doing okay Jade...that could not have been easy, but you made the selfless decision out of love, so trust that it was the right decision. I'm so sorry to hear about Diesel, I hope you're doing okay! I don't exactly know how it feels to lose a pet, but I can only imagine. So so sorry to hear this, it's so sad, I get emotional if I think about when the day will come that something similar happens to our family dog. They are so much more than pets and only people with a dog can truly understand how they become such an integral part of the family. Stay strong sweetie, he's not in pain any more. So sorry to hear about Diesel! He is such a beautiful dog. I am a HUGE animal lover. Unfortunately, I have also had to make that hard decision. It's not easy at all. Stay strong! I'm sending love and prayers to you and your family. Jade - I just came across your blog this afternoon and I saw this post. I almost started crying myself. Years ago my family and I had to put our black lab down due to lung cancer. It IS the most difficult decision and takes a long time to heal from. I am recently married (November 2013) and we just got our own pup. He is a golden retriever, Jax - I LOVE HIM! I cannot imagine my life without him and we have only had him for 5 months. It is truly an amazing thing - having a pet - that becomes a TRUE part of your family. I pray for your continual healing and I know you did what was in the best interest of Diesel. On a brighter note - you are BEAUTIFUL, I LOVE your fashion and I appreciate your proclamation of your faith. I am a Christian and I just love seeing women bloggers share their faith!! !